Here at Sailtech, we have built our reputation on some basic, but fundamental principals; Good designs, the best available materials and impeccable attention to detail. Our unserving commitment to these attributes ensures that Sailtech remain the world leader in the cruising market. In addition, our personal service and after sales support ensure that purchasing your sail from Sailtech will be an enjoyable experience. Sailtech works closely with Doyle Sails, which is as a world leader in sailmaking through practical on the water experience combined with one of the largest investments in the industry for ongoing R&D and product development. We are commited to our customers where our sails can be seen all over the world on a range of boats and leading yachts. With experience of winning combinations as well as learning we know what makes for the best option and the fastest sail in the real world. Doyle Sails take great pride in the sails we make for our global market. Advanced sail technology for unsurpassed performance. Stratis™ combines Doyle’s long standing design expertise with innovative in-house fibre aligned technology. Specialised design and manufacture deliver unsurpassed shape retention and performance throughout the most demanding race conditions. Stratis™ advanced fibre-aligned sails make load-path technology available to the racer and cruiser racer alike. Combining world-leading design with innovative engineering and materials technology, Stratis™ sail laminates are custom designed and manufactured to the individual specifications of each sail. Stratis™ sail laminates are stronger, hold their shape better, with much less stretch and are significantly lighter than conventional panel sails. 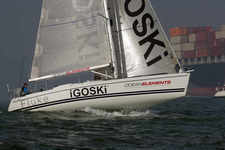 Stratis™ custom designed, fibre aligned sail technology is now available to all sailors, not just Grand Prix racers.